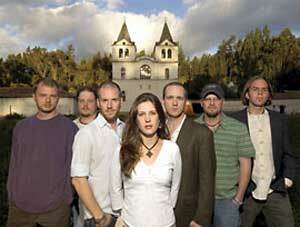 Folk-rock group Caedmon's Call has always had a heart for corners of the world such as this. Throughout their incredible twelve-year history, they've focused much of their ministry toward global causes, working to benefit such aid-giving organizations as Compassion International and India's Peace Gospel Ministries since the mid-nineties. In years past, band members have traveled to Bolivia, Ecuador, and Haiti, where they witnessed faith behind the eyes of poverty-stricken people and were changed. Today, the group has followed this calling beyond their musical borders too, creating Share the Well, a culturally-influenced album they began while traveling to India, Ecuador, and Brazil in spring 2004. And although the band has sold more than a million and a half albums in its career, recorded seven #1 singles, won numerous awards for unparalleled musicianship, and performed for college students in almost every part of the United States, they consider this endeavor more important than all their accolades strung together. "The truth is, as believers, we've been called to help these people," lead vocalist Cliff Young explains. "In America, we live by a self-centered version of Christianity. We forget the Great Commission. We think we aren't called to help people because our gifts and talents lie elsewhere. Instead, we should be asking how we can use the gifts we've been given to go to all the world and live out the message of the Gospel." In early 2003, Young met leaders from Dalit Freedom Network, a ministry to the severely demoralized Indian population called Dalits (meaning "oppressed"). Through their conversation, he discovered staggering facts about the Dalit people that he shared with the rest of the band. Victims of the caste system, Dalits are deemed the lowest class in India, referred to as the "untouchables," by their lack of worthiness. Stripped of their most basic human rights, they are forced into extreme poverty, treated as animals-tortured, beaten, and removed of their dignity, with no real hope of ever rising beyond their circumstances. Staggeringly, the 250 million Dalits in India exceeds the entire US population. Share the well my friend. While journeying to some of the most deprived parts of India, Ecuador and Brazil, Caedmon's Call awoke to even more harsh realities. They encountered people living next to vast sewage dumps. They performed songs and puppet shows for village children, most who lived in huts with dirt floors. They met eager musicians who traveled for as long as three days in trains, standing up the entire trip, to come play for the band. "We recorded their music every place from a remote village in the middle of India to a room above a restaurant in Ecuador," remembers drummer Todd Bragg. "We would hear musicians that came to play their songs for us and in the process we would hear their stories." To document these bits of song material, Caedmon's Call brought along portable recording equipment and several songwriters, including Aaron Senseman ("Before There Was Time"), Randall Goodgame ("Hands of the Potter"), Josh Moore (the band's keyboardist), and their newest official member, Andrew Osenga (guitars/vocals.) The group jotted song ideas as they traveled from town to town, exploring tiny ransacked villages in Ecuador, meeting wide-eyed Brazilian children, and dodging cattle and aimless rickshaws on the chaotic streets of Bombay. One evening, the band gathered at a mission in Lucknow. They'd invited musicians from all over India, along with representatives of some of the poorest local areas. A large feast was planned for the crowd, most who on a typical day wouldn't know where their next meal was coming from. "We were standing in the courtyard surrounded by all these people, eating and talking, and playing music together," recalls Young. "I remember commenting to a head member of Dalit Freedom, Dr. D'Souza: 'this is what heaven is going to be like, sitting and dining with the broken, the downtrodden, the oppressed.'" There were other memorable nights in India as well, like the one when songwriters Moore and Goodgame, sweating from the heat while eating cold rice and curried chicken and being devoured by mosquitoes, hatched the verses for a song called "Dalit Hymn." The next day, they added a group of Dalits chanting to the choruses. More songs followed, many completed back home in the band's native Houston, Texas, as the members folded pieces of their unforgettable experiences into colorful stories sung against pan flutes, hand drums and other instruments carried back from their trips. Share the Well came from the band's personal desire to impact other cultures, but spreading awareness to their audience is another goal. A nationwide fall tour reunites Caedmon's Call with musicians from India, Brazil, and Ecuador, who will climb aboard tour buses along with the band. Fans will not only enjoy an unprecedented concert of ethnically-rich music, they'll hear personal accounts of life in a third-world country. And hopefully, they'll be inspired to get involved. "It's easy to watch the National Geographic Channel and think about how hard it is for people in other countries who do not have the resources or religious freedoms that we do in America. It's much harder to get off the couch and do something about it," comments bassist Jeff Miller. "I pray that our concerts will get people educated, interested, and excited about what they can do." For their own contribution, Caedmon's Call hopes that revenue from sales and touring will benefit the organizations they support. Specifically, the band hopes to raise money to build two Dalit schools so these children will have a chance for a decent education, something commonly reserved for higher caste kids. From stage, the group will also continue to encourage child sponsorships through Compassion International. It's a small part in a vast sea of need, but the journey has to start somewhere. And for Caedmon's Call, slowing down is something they seldom consider. As longtime friend and opening act Goodgame observes about the band, "They are not afraid to see themselves as just a few of God's rusty tools. Spotlight, no spotlight, that's not what drives them. It's the knowledge of the freedom of the Gospel, and the desire to challenge the church and themselves to spread it to the corners of the earth."